2.We will quote for you according to the requirement . 3.We will deliver the products only when we received all payment. 3.We accept deliver products according to your requirement . We focus on a series of hot sale kits, desgin and develop fashion parts based on the negotiation with customers. 4. after sending, we will track the products for you once every two days, until you get the products. Q1. What is your terms of packing9 A: Generally, we pack our goods in neutral white boxes and brown cartons. Cylinder slides forward for parking brake applications. Supplied complete for quick and easy installation. Cylinder slides forward for parking brakes. 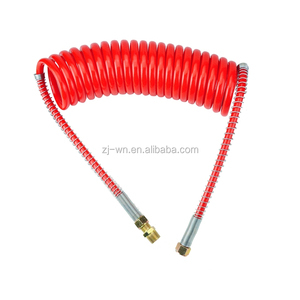 Air Brake Hose Material NBR/PVC, NBR/CSW, ECO, ACW Size 6X1, 8X1, 1.5X9.5, 12X1 Type American, European Car Make Truck, Trailer, Tractor Colour Red, Black, Blue,Green,White,Yellow Working Pressure and Operating Temperature: 1 Mpa and -40&deg;C~120&deg;C Length 3M, 3.5M, 4M, 5M, 7M FOB Price USD 1~5/piece Delivery Time Within 10 days after receive TT deposit or LC Port Xiamen, Qingdao Packaging Details By Carton in seaworthy packing Payment L/C, T/T,Western Min Order Quantity 500 Pieces Supply Ability 100,000 Pieces/Week Certificate ISO9001:2000/TS16949 Xiamen Tinmy Autoparts Co., Ltd. , which belongs to Tinmy Group, is a leading supplier in auto parts that organized by several factories and successfully certified with TS16949 and ISO9001/2000 quality control system. 4. after sending, we will track the products for you once every two days, until you get the products. If you have any questions about the problem, contact with us, we will offer the solve way for you. Q1. What is your terms of packing9 A: Generally, we pack our goods in the plain brown cartons. Our recommendations: 1)We specialize in nylon tube spring coil and hydraulic tube fittings . 2)Our products sells well both home and abroad for our strict control on quality and competitive price. Performance : Smooth surface, wear-resistant, resistant to high pressure, corrosion resistance, safe and reliable. 4)Any dimension, special colours and requires can be producted according to yours requirements. 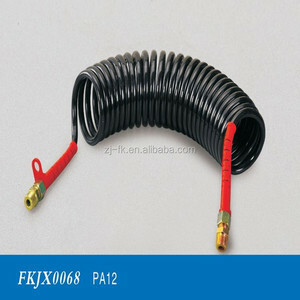 Our recommendations : 1)We specialize in nylon tube spring coil and hydraulic tube fittings . 2)Our products sells well both home and abroad thanks for our strict quality control and competitive price. 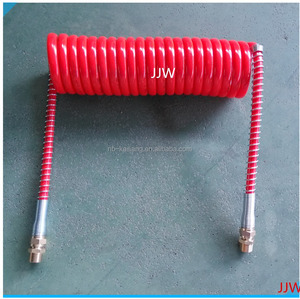 JJW air brake hose has features of smooth inner wall,quick air breaking , less pressure lost, wear-proof,anti-aging and good flexible,etc. It is widely used in large scale on pipeline connections on various tractor trucks, semi-trailers, trailers and all kinds of air brake system,etc. The suitable temperature ranges from--40&deg;C~120&deg;C. Mode No. Turns No. 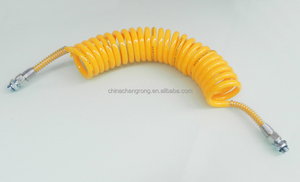 or no fittings 6) Explosion Pressure : 6Mpa(=60Bar) 7)Polyamide 12 (PA) Air Coils 8) O. D&times;Wall thickness :12&times;1.5mm 9) Protection : Spring or plastic. 10)Working pressure is 1.5 ~ 15MPa(15 ~150Bar), burst pressure is up to 60 kg. 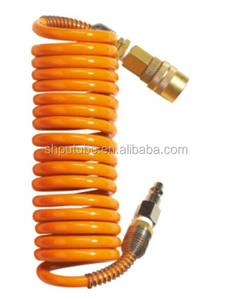 Alibaba.com offers 87 suzi coil hose products. About 3% of these are rubber hoses. 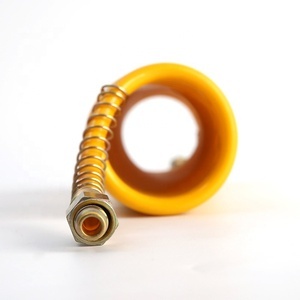 A wide variety of suzi coil hose options are available to you, such as free samples. 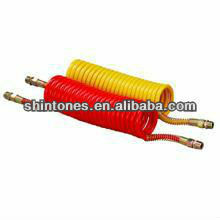 There are 87 suzi coil hose suppliers, mainly located in Asia. The top supplying country is China (Mainland), which supply 100% of suzi coil hose respectively. 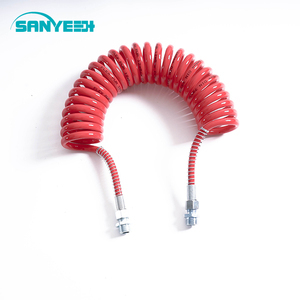 Suzi coil hose products are most popular in Eastern Europe, Western Europe, and Domestic Market. You can ensure product safety by selecting from certified suppliers, including 87 with Other, 55 with ISO/TS16949, and 15 with ISO9001 certification.